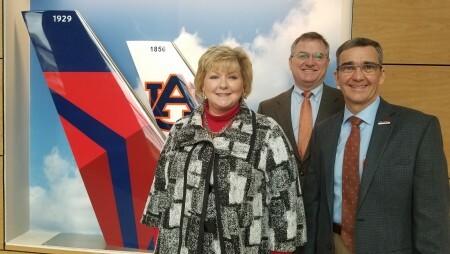 On Wednesday, Feb. 6, faculty, staff and students of Auburn University’s Delta Aviation Education Building welcomed the Auburn Rotary Club for a tour of the new facility and an overview of programs in the Department of Aviation. The department, now based in the College of Liberal Arts, offers undergraduate degrees in Professional Flight and Aviation Management. Pictured with Dr. Bill Hutto (far right), a Rotarian who serves as director of the Aviation Center and acting chair of the Department of Aviation, is Rotary Club President Hope Stockton and College of Liberal Arts dean and Auburn Rotarian Dr. Joe Aistrup, who served as the program host. In honor of Hutto’s presentation, the Auburn Rotary Club donated a copy of “Wright Brothers, Wrong Story” by William Hazelgrove to the Auburn Public Library. The Auburn Rotary Club meets each Wednesday from noon to 1 p.m. at Saugahatchee Country Club. For more information about the Auburn Rotary Club or how to become a member, visit www.auburnrotaryclub.com.